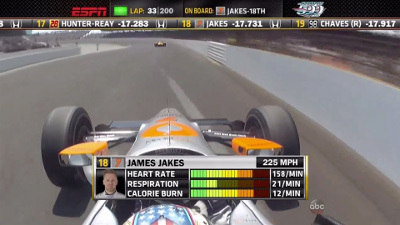 This year’s Indy 500 was exciting on many levels but this time we could see how the drivers felt too. We kitted out two drivers, James Jakes and Sage Karam, with our driver monitoring Pilot™ device. Unfortunately for Sage, he was taken out of the race right at the very beginning but James Jakes crossed the line in 18th. The driver heart rate, breathing rate and calorie burn were collected by yellowcog Pilot™ devices which were integrated with the cars. 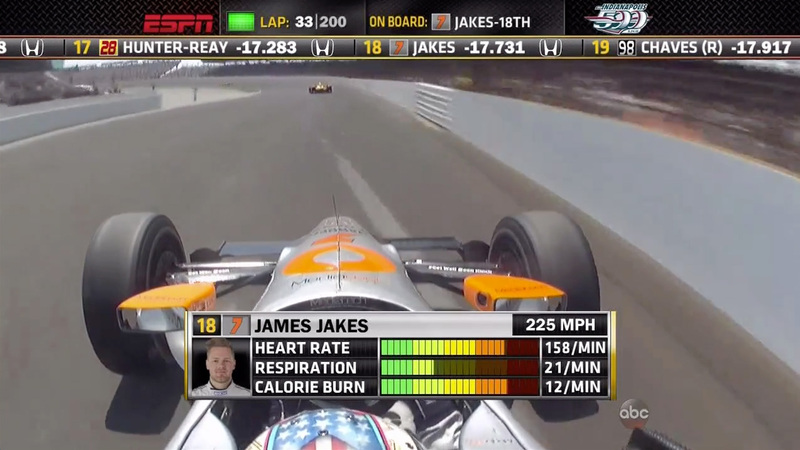 The driver data was sent to ABC/ESPN’s outside broadcast facilities where it was used to create the on-screen graphics. There were multiple broadcasts of the information during the race, reaching an audience of over six million race fans. Yellowcog's technology is proven reliable and robust, vital in any race. It is not just the parameters shown that were collected; many other parameters were too, including g-forces, temperature and stress levels. This is just the beginning – we will be bringing more on-screen insight in other races and series. 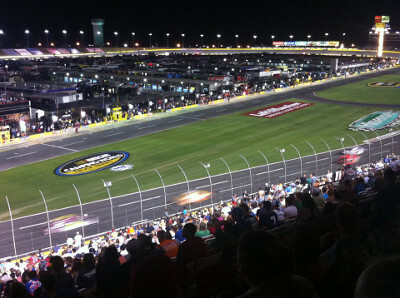 Yellowcog is on a ten-day tour of US motorsport to meet with people and teams competing in and supplying the industry. The trip was organised by the Motorsport Industry Association and supported by the UKTI. The trip is in two parts: Charlotte, North Carolina and Indianapolis, Indiana. 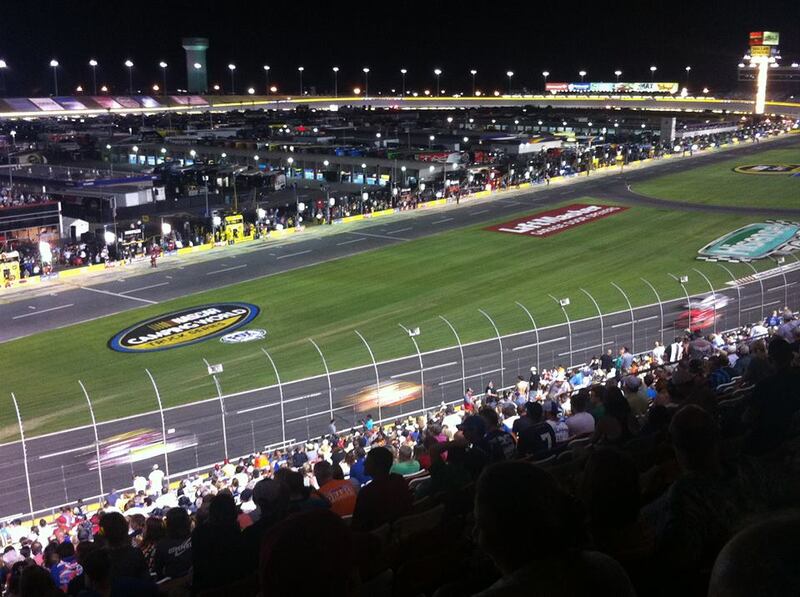 Charlotte is the home of NASCAR and Indianapolis is home to IndyCar. The reason for our visit is to learn the needs of US motorsport, how it operates and, of course, to raise awareness of the importance of driver and pit crew monitoring for safety and performance. We’ve visited NASCAR, The Speedway Club, Roush Fenway Racing, Chip Ganassi Racing, Richard Childress Racing, Penske Racing, Riley Technologies, Goodridge and representatives of many other companies. The Silverstone Dunlop Britcar 24 Hour had everything! It was a new experience for yellowcog to attend a full 24-Hour race and work with a team collecting data from the drivers. And when you’re there for the first time, who better to be there with than Aston Martin? The factory team are from Aston’s Special Projects outfit and work on cars like the new Vulcan. 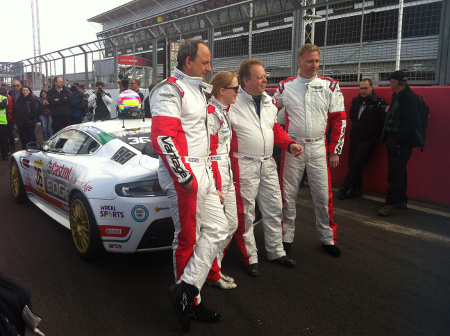 The Aston Martin works team fielded four drivers and what a fantastic bunch they were. All the drivers did a sterling job in sometimes treacherous conditions with heavy rain in the early hours. None of the drivers had taken part in an endurance race of this sort and night time driving was completely new. The driver line-up saw Andy Palmer (Aston Martin’s CEO) joined by Marek Reichman (Aston’s chief designer), Andrew Frankel (motoring journalist) and Alice Powell (awesome racer). It was great to see them pulling together, sharing information and watching CEO Andy bringing the indefatigable Aston Martin home in fifth. A remarkably good result for the vehicle’s class. Of course, it was not all down to the drivers, it was as much the other team members’ victory. The mechanics, strategists, marketing, physios, race engineers all worked through the night. We also had a great bunch of (some new) friends dropping in to help keep us all sane. It was a good day for Aston all-round; the Beechdean Aston Martin Vantage GT4 won the race and the Speedworks Motorsport Aston came forth making a total of three Astons in the top five. We’re off to monitor drivers at the Roar Before the Rolex 24 at the Daytona International Speedway. The event is one huge three-day practice session for the upcoming season and especially the Rolex 24 at Daytona later this month. We will be there monitoring multiple drivers with the data being relayed live to the pit wall. The Roar could easily be mistaken for a full race event – there are twelve hours of track action each day, for three days. It’s not just the teams that are practicing – all the facilities for the fans are there too. It is great to see how fan-focused motorsport can be – The Roar features fan forums, tech talks, garage tours and entertainment. At only $15 for a day ticket it also offers a lot of beautiful cars for not a lot of money. 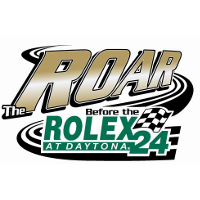 The broadcast of the Rolex 24 at Daytona International Speedway this weekend (24/25 January 2015) will include analysis of driver vital signs collected using Yellowcog’s Pilot™ system. 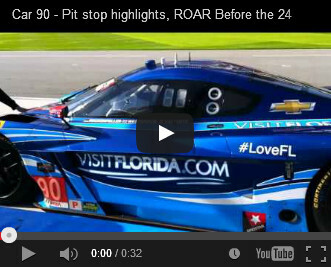 We were at the ROAR Before the 24 at the speedway a week ago where we kitted out a car for the Rolex 24. We monitored drivers in two teams: Spirit of Daytona AKA VisitFlorida.com Racing and also Mantella Autosport. Spirit of Daytona compete in the TUDOR United SportsCar Championship with drivers Richard Westbrook (UK), Michael Valiante (Canada) and Mike Rockenfeller (Germany). Mantella Autosport compete in the Continental Tire SportsCar Challenge with drivers Martin Barkey (Canada) and Kyle Marcelli (Canada). We recorded a lot of useful driver data over the three days. It was great to be in the pit lane and see how their vital signs reacted corner by corner to the changing loads. These guys, being true athletes, also showed impressive recovery times. The system will now be used for the upcoming Rolex 24 at Daytona. As the name implies, this is a full 24-hour race under the blue skies then floodlights of the Daytona Speedway. The TUDOR series features a range of incredible cars: Aston Martin Vantage, BMW Z4, Chevrolet Corvette, Dodge Viper, DeltaWing, Ferrari 458 and Porsche 911. Spirit of Daytona run a V8 Chevrolet Corvette Daytona Prototype, which as the photos here show is a beautiful machine. It is well worth clicking on some of the videos as the noise is more than half of its appeal. The Continental Tire SportsCar Challenge series features cars including the Chevrolet Camaro Z/28.R (as driven by Martin and Kyle) as well as the Ford Mustang Boss 302R, Porsche 911, Nissan 370Z, Subaru WRX STI (which we have a soft spot for after our time on the Isle of Man) and more Aston Martin Vantages. The technical integration was straightforward; we kitted out the Spirit of Daytona car with yellowcog’s Pilot™ system, integrating it with the on-board MoTeC data logging and telemetry. The MoTeC software made it simple to bring up the driver vital signs at the pit wall. We then relayed the information to an additional laptop so that driver vital signs could be viewed by those not on the pit wall. Vital signs include heart rate, breathing rate, core temperature and g-forces. 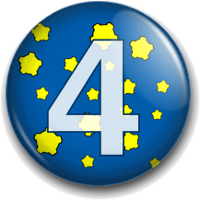 Yellowcog is 4 today! It has been quite a year! We’ve spent our time in many different countries, working with many fantastic people. 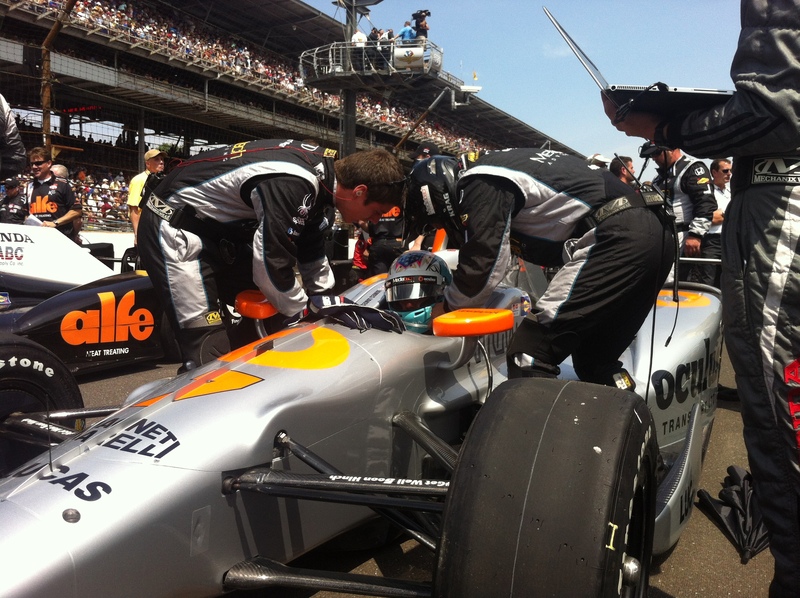 We’ve seen our racing driver monitoring used in some of the most famous events in the world and appeared on TV – twice! Our logo is now a registered trademark, we’ve become a Microchip Authorised Design Partner, our prototyping facilities have been expanded and we’ve forged new partnerships with some impressive companies. Yellowcog is a research and development focused company so we haven’t stood still; we’ve been designing some great new technology too. As we now go into our fifth year we’re becoming stronger and stronger – we’ve always relied on our profits to fund our activities and momentum is really picking up. Thanks to those who have worked with us, bought from us, advised us and supported us. See you all again soon!